Geoffrey is an igneous petrologist and economic geologist with an interest in general petrological problems and related ore-forming processes; including, kimberlite magma genesis and emplacement, evolution of the sub-cratonic mantle through the study of mantle xenoliths and diamonds, origin of ore deposits in layered intrusions, and evolution of magmatic plumbing-systems on Mars. Kimberlite and mantle related studies are based out of the University of Cape Town making use of the world famous ‘Mantle-room’ collection comprising 1000’s of samples collected over several decades by Prof. John Gurney and colleagues, as well as filed trips to various kimberlite pipe localities in southern Africa and recent project development into West Africa kimberlites. The study of magmatic-systems on Mars was developed during his period as a post-doc at the University of Tennessee (2013-2015) and continues with colleagues in the USA. These studies are based on the petrology of the shergottite meteorites that originate from Mars, which are kindly loaned from the NASA Johnson Space Centre. Geoffrey did his undergraduate and postgraduate studies at Rhodes University receiving a PhD in Geology based on a study of Fe-Ti-V oxide formation in the Panzhihua mafic layered intrusion in SW China. He went on to do a post-doctoral research fellowship with Prof. Lawrence Taylor at the University of Tennessee. He then did a second post-doc at UCT from 2015 to 2017. 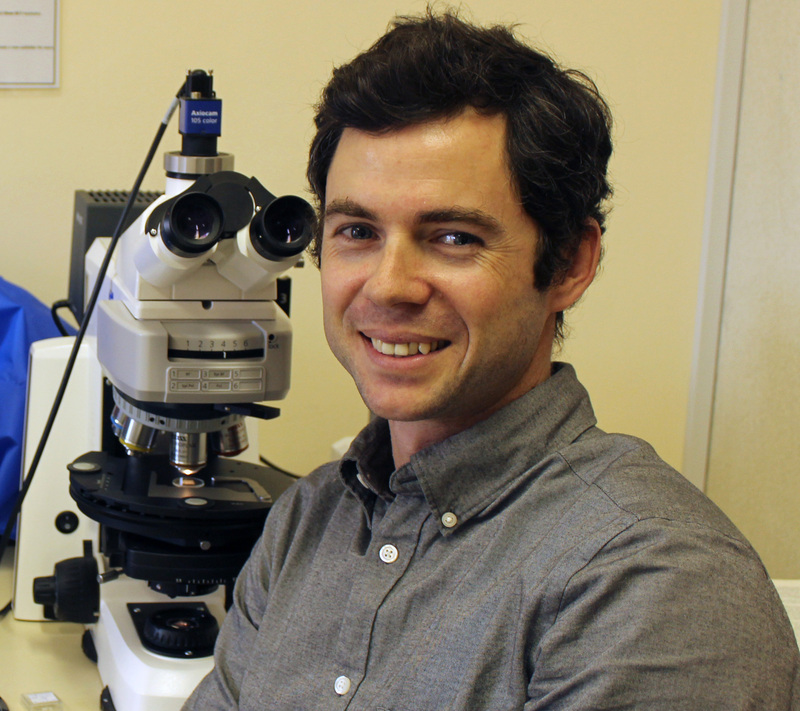 Geoffrey was then appointed as an Assistant Professor at the University of Georgia where he worked for a year before returning to UCT as a Lecturer in the Department of Geological Sciences in 2019. Howarth, G. H., & Büttner, S. H. 2019. New constraints on archetypal South African kimberlite petrogenesis from quenched glass-rich melt inclusions in olivine megacrysts. Gondwana Research. Abersteiner, A., Kamenetsky, V. S., Goemann, K., Giuliani, A., Howarth, G. H., Castillo-Oliver, M., ... & Cherry, A. 2019. Composition and emplacement of the Benfontein Kimberlite Sill complex (Kimberley, South Africa): Textural, petrographic and melt inclusion constraints. Lithos. Howarth, G. H. 2018. Olivine megacryst chemistry, Monastery kimberlite: Constraints on the mineralogy of the HIMU mantle reservoir in southern Africa. Lithos, 314-315, 658-668. Howarth, G. H., Udry, A., & Day, J. M. 2018. Petrogenesis of basaltic shergottite Northwest Africa 8657: Implications for fO 2 correlations and element redistribution during shock melting in shergottites. Meteoritics & Planetary Science, 53(2), 249-267. Howarth, G. H., & Harris, C. 2017. Discriminating between pyroxenite and peridotite sources for continental flood basalts (CFB) in southern Africa using olivine chemistry. Earth and Planetary Science Letters, 475, 143-151. Howarth, G. H., Day, J. M., Pernet-Fisher, J. F., Goodrich, C. A., Pearson, D. G., Luo, Y., ... & Taylor, L. A. 2017. Precious metal enrichment at low-redox in terrestrial native Fe-bearing basalts investigated using laser-ablation ICP-MS. Geochimica et Cosmochimica Acta, 203, 343-363. Udry, A., Howarth, G. H., Lapen, T. J., & Righter, M. 2017. Petrogenesis of the NWA 7320 enriched martian gabbroic shergottite: Insight into the martian crust. Geochimica et Cosmochimica Acta, 204, 1-18. Pernet-Fisher, J. F., Day, J. M., Howarth, G. H., Ryabov, V. V., & Taylor, L. A. 2017. Atmospheric outgassing and native-iron formation during carbonaceous sediment–basalt melt interactions. Earth and Planetary Science Letters, 460, 201-212. Howarth, G. H., & Udry, A. 2017. Trace elements in olivine and the petrogenesis of the intermediate, olivine‐phyric shergottite NWA 10170. Meteoritics & Planetary Science, 52(2), 391-409. Howarth, G. H., & Taylor, L. A. 2016. Multi-stage kimberlite evolution tracked in zoned olivine from the Benfontein sill, South Africa. Lithos, 262, 384-397. Howarth, G.H., Liu, Y., Chen, Y., Pernet-FIsher, J.F., and Taylor, L.A. 2016. Postcrystallization metasomatism in shergottites: Evidence from the paired meteorites LAR 06319 and LAR 12011. Meteoritics and Planetary Science (Special Issue on Martian Volatiles), doi: 10.1111/maps.12576. Taylor, L. A., Logvinova, A. M., Howarth, G. H., Liu, Y., Peslier, A. H., Rossman, G. R., ... & Sobolev, N. V. 2016. Low water contents in diamond mineral inclusions: Proto-genetic origin in a dry cratonic lithosphere. Earth and Planetary Science Letters, 433, 125-132. Howarth, G.H., Pernet-Fisher, J.F., Bodnar, R.J., and Taylor, L.A. 2015. Evidence for the exsolution of Cl-rich fluids in martian magmas: Apatite petrogenesis in the enriched lherzolitic shergottite Northwest Africa 7755. Geochimica et Cosmochimica Acta, 166, 234-248. Howarth, G.H., Sobolev, N.V., Pernet-Fisher, J.F., Ketcham, R.A., Maisano,J., Pokhilenko, L.N., Taylor, D., and Taylor, L.A. 2015. 3-D X-ray tomography of diamondiferous mantle eclogite xenoliths from Siberia: A Review. Journal of Asian Earth Sciences (Invited Review), 101, 39-67. Pernet-Fisher, J.F., Howarth, G.H., Pearson, D.G., Woodland, S., Barry, P.H., Pokhilenko, N.P., Pokhilenko, L.N., Agashev, A.M., and Taylor, L.A. 2015. Plume impingement on the Siberian SCLM: Evidence from Re-Os isotope systematics. Lithos, 218-219, 141-154. Logvinova, A.M., Taylor, L.A., Fedorova, E.N., Eliseev, A.P., Wirth, R., Howarth, G.H., Reutskii, V.N., and Sobolev N.V. 2015. Unique xenolith of diamond-bearing pyrope peridotites from the Udachnaya kimberlite pipe, Yakutia: the role of subduction in diamond generation. Russian Geology and Geophysics (Geologiya i Geofizika), 56, 306-320. Barry, P.H., Hilton, D.R., Day, J.M.D., Pernet-Fisher, J.F., Howarth, G.H., Magna, T., Agashev, A.M., Pokhilenko, N.P., Pokhilenko, L.N., and Taylor, L.A. 2015. Helium isotopic evidence for modification of the cratonic lithosphere during the Permo-Triassic Siberian flood basalt event. Lithos, 216, 73-80. Pernet-Fisher, J.F., Howarth, G.H., Liu, Y., Chen, Y., and Taylor, L.A. 2014. Estimating the lunar mantle water budget from phosphates: Complications associated with silicate-liquid-immiscibility. Geochimica et Cosmochimica Acta, 144, 326-341. Howarth, G.H., Pernet-Fisher, J.F., Balta, J.B., Barry, P.B., Bodnar, R.J., and Taylor, L.A. 2014. Two-stage polybaric formation of the new enriched, pyroxene-oikocrystic, lherzolitic shergottite, NWA 7397. Meteoritics and Planetary Science, 10, 1812-1830. Howarth, G.H., Sobolev, N.V., Pernet-Fisher, J.F., Barry, P.B., Penumadu, D., Puplampu, S., Ketcham, R.A., Maisano, J.A., Taylor, D., and Taylor, L.A. 2014. The secondary origin of diamonds: multi-modal radiation tomography of diamondiferous eclogites. International Geology Reviews, 56, 1171-1180. Pernet-Fisher, J.F., Howarth, G.H., Liu, Y., Barry, P.H., Carmody, L., Valley, J.W., Bodnar, R.J., Spetsius, Z.V., and Taylor, L.A. 2014. Komsomolskaya diamondiferous eclogites: Evidence for oceanic crustal protoliths. Contributions to Mineralogy and Petrology, 167, 981-998. Howarth, G. H., Barry, P. H. Pernet-Fisher, J. F., Baziotis, I. P., Pokhilenko, N. P., Pokhilenko, L. N., Agashev, A., Bodnar, R. J., and Taylor, L. A. 2014. Superplume metasomatism: Evidence from Siberian mantle xenoliths. Lithos, 184, 209-224. Howarth, G. H. and Skinner, E. M. W. 2013. Sub-volcanic development of kimberlite pipes: Evidence from the Lace and Voorspoed (Group II) kimberlites, South Africa. Journal of Volcanology and Geothermal Research, 268, 1-16. Howarth, G. H. and Prevec, S. A. 2013. Trace Element, PGE, and Sr-Nd isotope geochemistry of the Panzhihua mafic layered intrusion, SW China: Constraints on ore-forming processes and evolution of parent magma at depth in a plumbing-system. Geochimica et Cosmochimica Acta, 120, 459-478. Howarth, G.H., Prevec, S. A. and Zhou, M-F. 2013. Timing of Ti-magnetite crystallization and silicate disequilibrium in the Panzhihua mafic layered intrusion: Implications for ore-forming processes. Lithos, 170-171, 73-89. Howarth, G. H. and Prevec, S. A. 2013. Hydration vs. oxidation: Modelling implications for Fe-Ti oxide crystallization in mafic intrusions, with specific reference to the Panzhihua intrusion, SW China. Geoscience Frontiers, Special Edition on the Panzhihua Intrusion, 4, 555-569. Ganino, C., Harris, C., Arndt, N. T., Prevec, S. A. and Howarth, G. H. 2013. Assimilation of carbonate country rock by the parent magma of the Panzhihua Fe-Ti-V deposit (SW China): Evidence from stable isotopes. Geoscience Frontiers, Special Edition on the Panzhihua Intrusion, 4, 547-554. Zhou, M-F., Chen, W. T., Wang, C. Y., Prevec, S. A., Liu, P. P., and Howarth, G.H. 2013. Two stages of immiscible liquid separation in the formation of Panzhihua-type Fe-Ti-V oxide deposits, SW China. Geoscience Frontiers, Special edition on the Panzhihua Intrusion, 4, 481-502. Howarth, G. H. and Skinner, E. M. W. 2012. The geology and emplacement of the volcaniclastic infill at the Voorspoed Group II kimberlite (orangeite) pipe, Kroonstad cluster, South Africa. Journal of Volcanology and Geothermal Research, 231-232, 24-38. Howarth, G. H.,Skinner, E. M. W., and Prevec, S.A. 2011. Petrology of the hypabyssal kimberlite of the Kroonstad Group II kimberlite (orangeite) cluster, South Africa: Evolution of the magma within the cluster. Lithos, 125, 795-808. Hanson, E. K., Moore, J. M., Bordy, E. M. Marsh, J. S., Howarth, G. and Robey, J. V. A. 2009. Cretaceous erosion in central South Africa: Evidence from upper-crustal xenoliths in kimberlite diatremes. South African Journal of Geology, 112, 125-140.